The good folks at Barber Foods have a new product that I was fortunate to review. 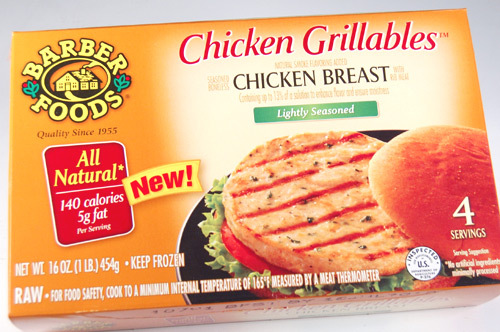 They are called Chicken Grillables™, and they are all-natural (no artificial ingredients and minimally processed) and lightly seasoned frozen chicken burgers. Click the image for a closer look. A quick glance at the ingredient list was a pleasant surprise. These are truly a good alternative to the basic burger. Each patty is 140 calories with only 5 grams of fat. I'm all for healthy alternatives, but the proof is ultimately in the taste. I cooked the patties over charcoal exactly according to the package directions. That means six minutes per side over a medium fire. My family was pleased with the results. My ladies are sauce queens, so I insisted that they initially taste them with only a little mayo. My middle daughter said they were "moist and delicious". They were a hit. So, the bottom line here is that these are well worth trying. They are a healthier alternative to the typical burger. They are brain-dead easy to prepare and don't leave you feeling deprived. I recommend these, and I encourage you to be creative and kick them up with some teriyaki sauce, Swiss cheese, and a grilled pineapple ring, or whatever you like. You can find a local retailer here. Buffalo - 2/3 Frank's Red Hot sauce and 1/3 mayo, mixed well. Italian - A slice of mozzarella cheese and pizza sauce. General Tso - Hoisin sauce (supermarket Asian section) and Tabasco, or this sauce, with some sliced scallions. California - Monterrey Jack, sliced avocado, and maybe some bacon and/or sprouts. Cape Cod - A slice of Dill Havarti cheese and a nice smear of smashed cranberry sauce. Mexican - A slice of pepper jack, guacamole, and picante sauce or salsa. Cordon Bleu - A slice each of ham and Gruyere or Swiss cheese, with a little mustard and mayo. Sweet & Sour - A little of your favorite sweet & sour sauce, and a grilled pineapple ring. Shroom & Swiss - A slice of Swiss cheese, and grilled or sauteed mushrooms.